To perform jazz requires more than an ability to read notes on a page and play an instrument accordingly. Jazz also demands improvisation, creativity, connection. “It’s an abstract way of thinking. We want to get students out of the sheet music,” explains David Carter, director of the Charleston Jazz Academy. One year has passed since Charleston Jazz adopted the Leonard School of Music, a North Charleston band program founded in 1945, and refocused the nonprofit’s efforts to encourage a broader local jazz community. From the freshly renovated class and studio space above Fox Music, the group’s ensemble of about 30 teachers coordinates lessons for students both young and old in jazz basics as well as collaboration, theory, composition, and performance. The diverse staff consists of academics, Broadway alumni, and touring musicians who offer private and small group sessions ranging from beginner band to vocals class to postmodern composition. Carter, a 30-year-old Goose Creek native who previously earned accolades as the band director at Cane Bay High School, dubs his teaching approach “the Five Ts:” time, tune, technique, tone, and tunes. The last, picked up from Charleston Jazz’s dynamic artistic director, Charlton Singleton, entails familiarizing aspiring players with the standard repertoire of jazz—think Miles Davis and John Coltrane. “We’re preparing our students for real-world situations, whether to write their own music in a professional setting, operate a technical sound system, perform a gig at a downtown restaurant, or continue the cycle as a teacher,” he explains. From in-house recitals to festival competitions, musicians take part in a score of concert opportunities. Throughout the Charleston Jazz Festival from Thursday, January 18, to Sunday, January 21, students will lend behind-the-scenes logistical assistance and also perform in the lobby of the Sottile Theatre during Sunday’s Family Day. To take a peek inside the school and hear from David Carter, click here. 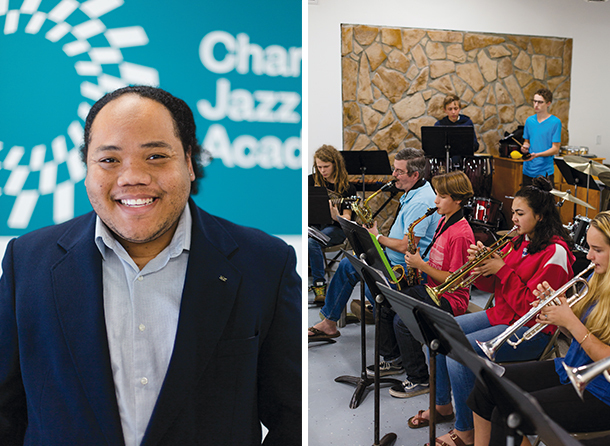 To learn more about the Charleston Jazz Academy, click here. To check out the Charleston Jazz Festival schedule, click here.